The level of economic participation and opportunity of South Korean women is well below the world average, ranking the country No. 115 out of 149 countries in terms of gender equality, according to a report from the World Economic Forum. 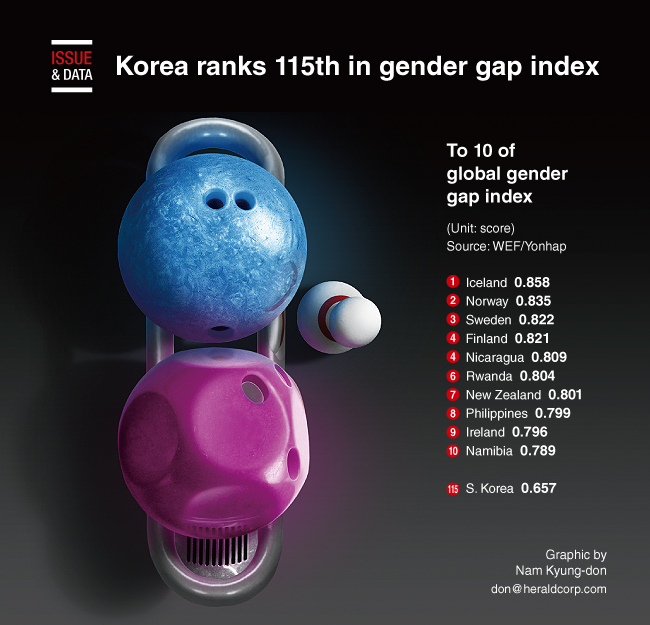 The forum‘s Global Gender Gap Report 2018 said South Korea’s gender gap index was 0.657, compared to 0.673 for China and 0.662 for Japan, which ranked Nos. 103 and 110, respectively. The annual report uses the Global Gender Gap Index to see how countries compare in terms of gender equality in four key areas: economic participation and opportunities; educational attainment; health and survival; and political empowerment.